Southeast London is familiar as home to two of our most well-known psychiatric hospitals, the Bethlem, and the Maudsley. 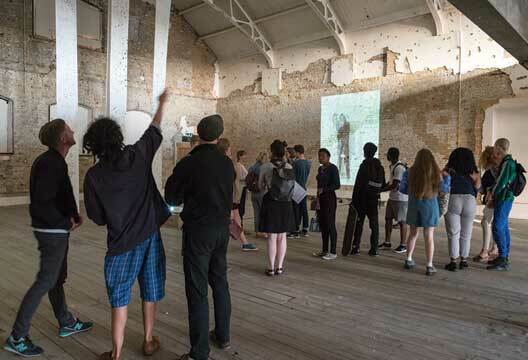 However, it’s also central to the current UK arts scene, something that should not come as much of a surprise given the presence of the Camberwell School of Arts, and the proliferation of galleries and experimental spaces in the area. I visited two small-scale projects with big ideas. Aged 14 to 21, the Art Assassins are a diverse collective who work alongside scholars and artists in the South London Gallery. They seek to answer fundamental questions about health, identity and society at large, doing so with an imaginative hands-on approach. Over the past year they have investigated the historical ‘Peckham Experiment’. Regarded as a ‘health utopia’, this holistic health movement took place in pre-NHS Peckham, London and aimed to promote health and wellbeing through community activities. Interestingly, the Art Assassins placed the lessons learned from the Peckham Experiment in the context of today’s age of consumer markets, where one can readily have genetic health risks identified in exchange for personal data. The artists took their individual DNAs – extracted from saliva samples – and pooled them into a collective DNA. The result was an exclusive art piece that was on display in the autumn. Further south, on the premises of world’s oldest psychiatric institution, is the Bethlem Museum of the Mind. Here, one can see the wonderful artwork of young people who accessed services in the Bethlem Adolescent Unit in ‘Our Future Likes’ (with Art Assassins also amongst the contributors). Sam Curtis, artist and curator who worked with the group, explained that image-making and open discussions were a ‘powerful form of communication’ for adolescents who ‘are at a loss, and may feel like they have little autonomy in their environment’. Mum, I don’t understand your emojis is a message imprinted on a white t-shirt displayed in the exhibition. This is just one of the creative ways in which the exhibition captures perspectives on the impact of social media on our mental health, inviting reflection on whether the ways in which we spend our time online may be at the root of depression and anxiety. Clearly, the wheels are turning for the use of creative approaches in the spheres of health and wellbeing. The Art Assassins and Our Future Likes demonstrate that when health disciplines fuse with the arts, the results can be empowering for young people.